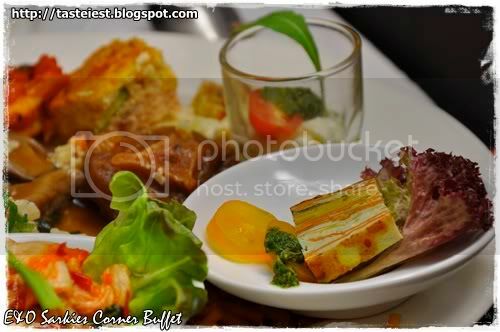 Eastern & Oriental Hotel, Penang Sarkies Corner Buffet is very well known for their buffet, serving good food with a lot variety but this is our first time to visit after temptation by so many great review by all food writer. 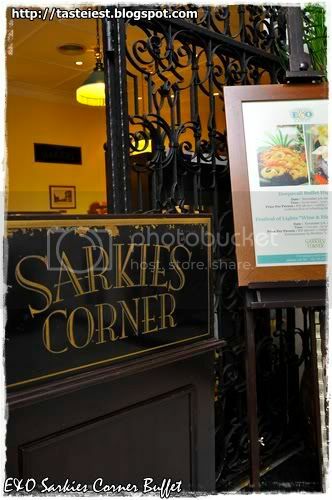 Sarkies Corner offer a wide selection of delicious local and international delicacy together with bottomless wine, beer and fruit punch. 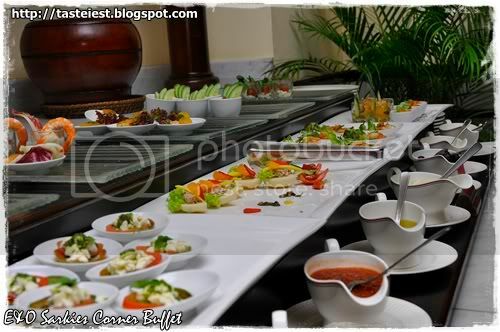 The fine design and decoration of food has allowed me to take almost 100 photos which might cause slowness if I will to load all into single page hence I will separate into two page which the first post will focus on Introduction and Appetizer, appetizer, second post is Main Dish while third post will put focus on Dessert. 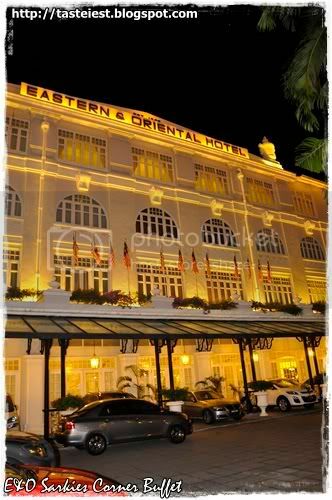 Just a day pass Deepavali and the price is slightly more expensive than usual which cost RM120++ for Saturday dinner buffet, advisable to park at E&O car park which cost RM5 but you can RM3 rebate from Sarkies Corner otherwise parking at clubbing area might cost you RM10 or RM15. 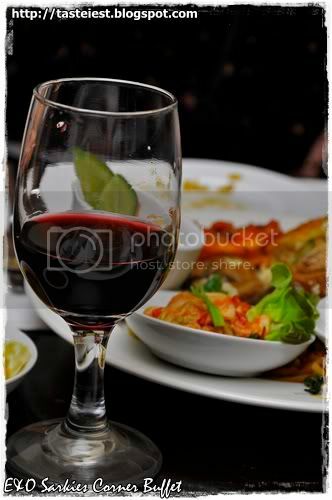 You get bottomless Wine and Beer for the buffet dinner, we took each a cup and this cup last us till the end of our dining without refill because it was way too strong for non-alcoholic like us but I must say the Red Wine is far more better than the White Fine as it was not that bitter and taste better. 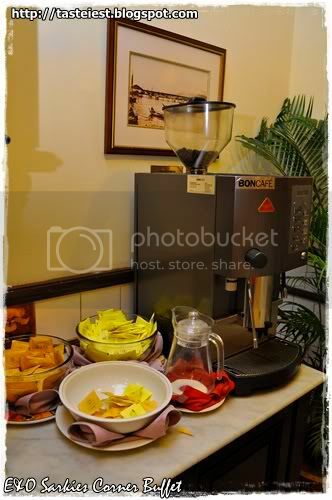 Coffee machine is available on far end of the restaurant, for those who like hot drink must not miss the coffee, while fruit punch is located in another corner. 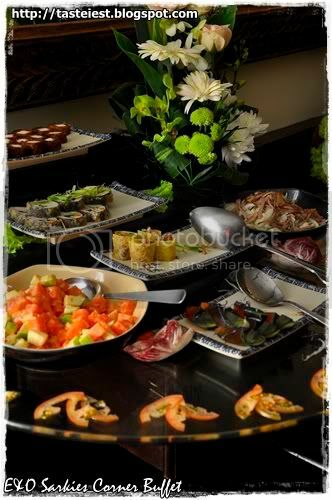 We start our appetizer with Sushi and Sashimi which just at the entrance of Sarkies Corner, various type of Sushi available for selection and Salmon is our choice as it really look great with layer of fat and meat. We just took one type of Rice Based Sushi to avoid reaching our quota so fast, the Salmon Sushi is very nice with fresh Salmon and Japanese Rice is just awesome. 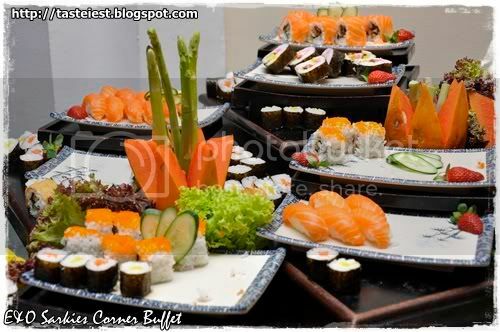 Other Sushi as well looks very good indeed. Next to Sushi is appetizer, Preserved Egg, Duck Meat Eggroll and other appetizer, I like the Duck Meat Eggroll, where roasted duck meat is cut into small pieces together with crispy skin roll with eggroll to create a Sushi like appetizer, the far right corner is also duck meat without skin and big portion is from the duck breast together with some vegetable to make it like a salad. 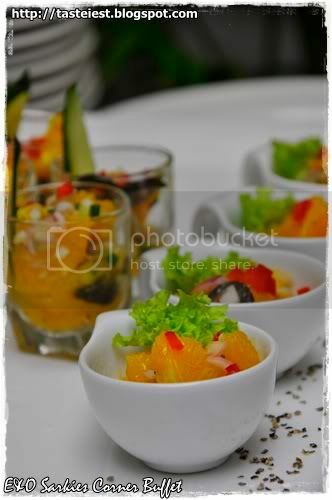 On the left orange color is not Salmon even though it look like instead it is a kind of fruit salad which taste really good. 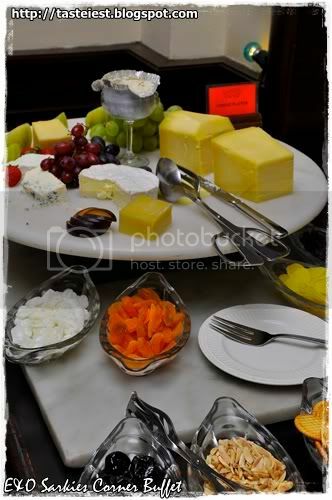 After appetizer corner you come to various Cheese for your selection to either apply on top of bread or biscuit, we did not take any as we are not really big fan of cheese that doesn’t melt. 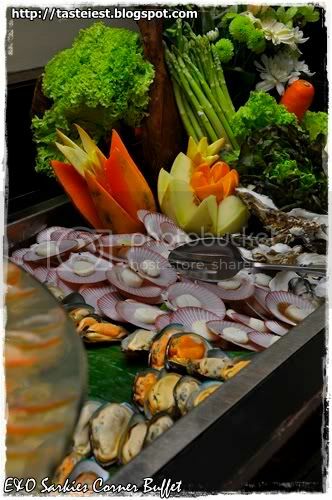 Great thing come next is the Sashimi, Oyster lover will definitely in love with Sarkies Corner Buffet because they has unlimited supply of raw oyster that keep on refill till we left. 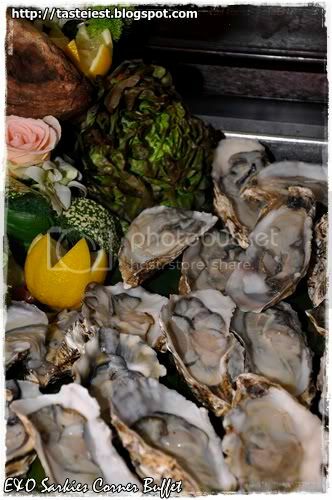 Oyster is really big and fresh taking with lemon is extremely delicious where the sea taste just came out from nowhere. 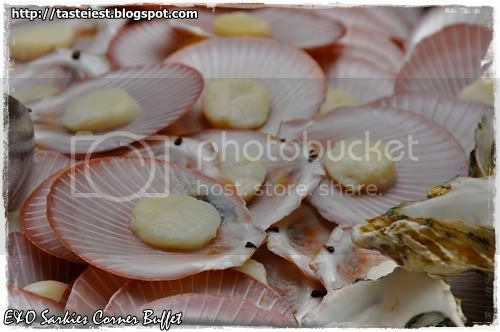 Taking another close up picture to make your mouth watering, and not only oyster instead there is fresh scallop that stacking high, scallop is fresh but the size is quite small. 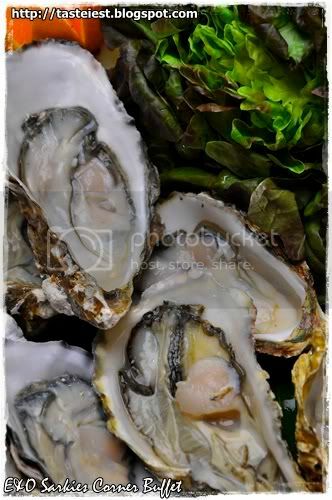 Muscle is just next if you have no worry on cholesterol level, big fresh muscle that tastes just as good as the oyster, sweetness from the sea. 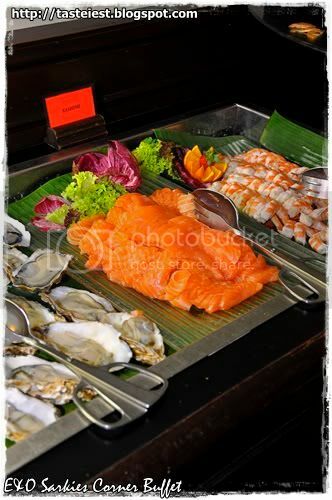 Sashimi corner should not miss the Salmon Sashimi, fresh thick cut of Salmon sashimi is so inviting and we has taking a lot of it with the wasabi is just a perfect combination, next to the Salmon is prawn, big prawn but the prawn texture is a bit hard and chewy. 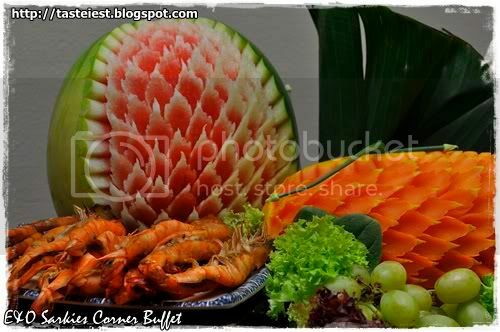 Garlic Prawn is sitting next to the well presented Watermelon and Papaya where highly skill chef crafting out the beautiful decorated item. 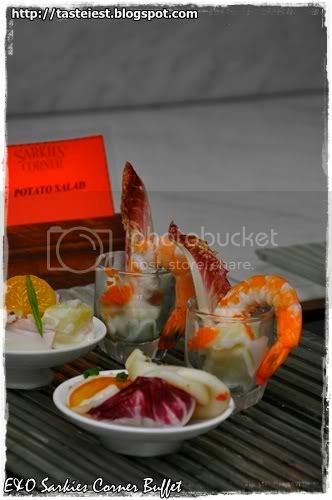 Very strong garlic flavor for the grill prawn, if you are garlic lover this dish must not be miss. 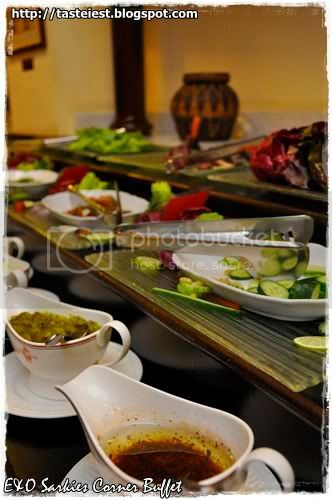 Continue next is the Salad corner, where huge range of dressing up for selection with various type of vegetable. 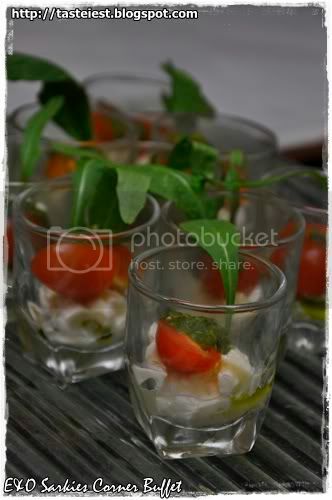 I just fail to name all the dressing, the variety is just way too much to be fix in my dictionary. 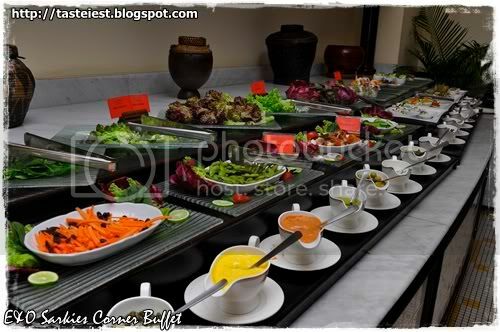 The dressings continue down the table and small plate of nicely decorated salad or cold food is available, or we call it spoon food where a small portion of food is served in spoon or small plate. 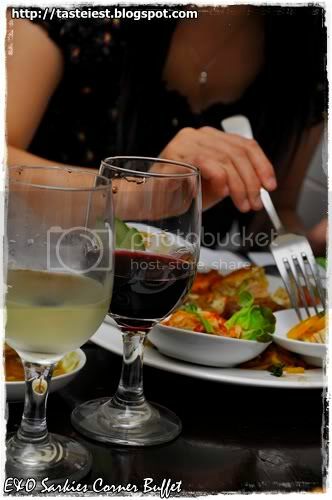 Even though the portion is small but we not able to try out each and every dish because the variety is way too much. 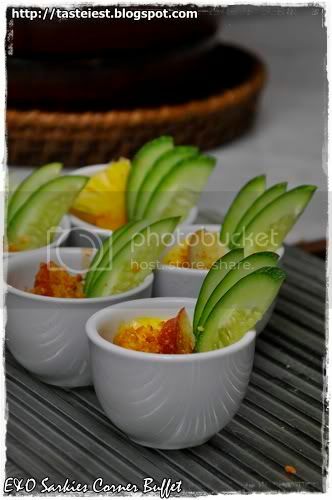 Water Apple, Pineapple and Cucumber on top and bottom fill with Cuttle Fish which is small version of Rojak in small nicely decorated cup, the cuttle fish is so tasty and nicely boiled to tender soft. It look like Tamago that normally you can easily get in Japanese Restaurant but it taste totally different which is very tasty but I just can’t tell what the ingredient used, it a little bit sweet and has a sponge cake feel. 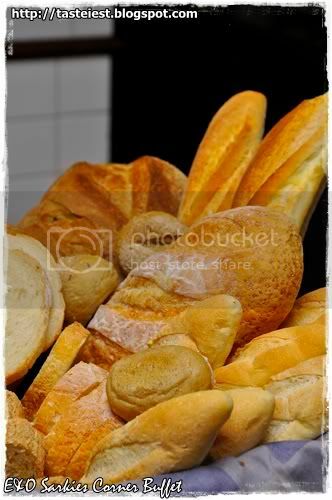 France Baguette, Garlic Bread, Oat Bread and a lot more other bread for your selection, either to dip into the soup provided or take it with butter, honestly no one is taking any of this except the garlic bread but it was quite disappointed because the garlic bread is quite hard and not much garlic flavor. 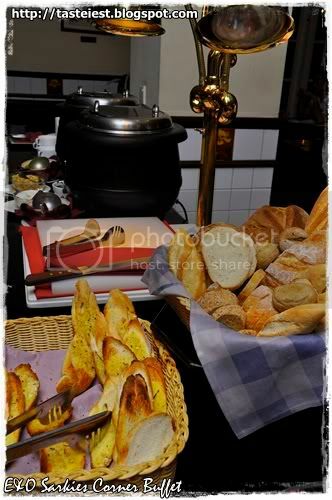 There is two soup to choose for, Shark Fin Soup and Pumpkin Soup. 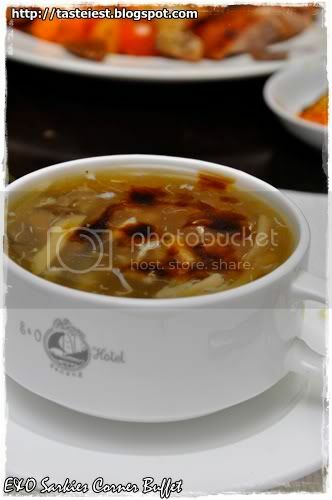 Shark Fin Soup is really tasty where broth boiled with real crab meat and mushroom to produce the strong taste of Shark Fin Soup. This is a multi page post, please continue to read next post.